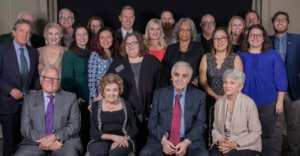 DALLAS, Dec. 3, 2018 – The Press Club of Dallas honored 17 winners and an additional 10 finalists from throughout Texas Dec. 1 at the 2018 Hugh Aynesworth Awards for Texas Journalism. The dinner and awards presentation was held at the Irving Convention Center. It was hosted by longtime WFAA TV investigative reporter Byron Harris. Named for veteran reporter and Press Club member Hugh Aynesworth ­­‒ a four-time Pulitzer Prize finalist ‒ the Aynesworth Awards honors Texas journalists’ work completed in 2017. The journalists and their news organizations represented Texas reporting in the following categories: daily newspapers, weekly newspapers, magazines, television, radio, and digital news sites. There was also a public service award that was open to all media organizations. Click here for highlights of the awards ceremony! The Press Club of Dallas, formed in 1948, is an organization of journalists and professional communicators in North Texas, committed to promoting the discipline of journalism, communication, literacy, current affairs, and First Amendment freedoms. Journalists, communications professionals, and students are eligible to join the organization.